Et bilde tatt etter messen søndag morgen – på pastoralrådsmøtet i Oslo katolske bispedømme, på Mariaholm 24.-26. oktober 2014. Det blir dessverre ingen tradisjonell latinsk messe i St Hallvard kirke søndag 26. oktober, siden jeg er bortreist på møte i bispedømmets pastoralråd (der jeg er varamann) fra fredag kveld til søndag ettermiddag. Det er planlagt messer for 23. november og 28. desember. A key document from the bishops’ Synod on the Family calling for the Church to make radical changes to its pastoral approach to gays, divorce and remarried and those in civil marriages has been criticised by Cardinal George Pell as “tendentious and incomplete”. But Cardinal Pell, one of Pope Francis’ close advisers, who has been tasked with reforming Vatican finances, said that the document was an “incomplete resumé” of what the Synod Fathers had said it needed to be “enhanced and corrected”. It’s one of the great mysteries of the meeting on family life taking place behind closed doors at the Vatican this week: Just where did the authors of a draft report come up with such ground-breaking language that gays had gifts to offer the church and that even homosexual partnerships had merit? Officially speaking, the draft report was a synthesis of the interventions from more than 200 bishops, a starting point for small working groups to propose amendments, elaborations, additions and subtractions to the drafting committee preparing a final report that will be released on Saturday. But conservative cardinals have said their views were not reflected in the draft, they blasted the report as “unacceptable” and said it was in sore need of an overhaul. Privileged, once again, to be invited to sing Mass for the Latin Mass Group in Copenhagen and to deliver a lecture (on the Fiftieth Anniversary of Unitatis Redintegratio), I again had a marvellous weekend. 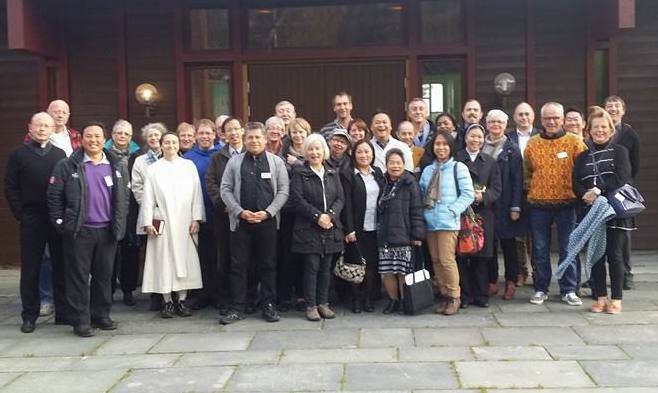 Danish hospitality is immensely warm; and a lead in this is given by Bishop Czeslaw. He seems to know priests and people intimately and individually, and is very much liked. I can see why. On my first visit, last year, I had breakfast with him, preceded by an invitation to celebrate the Extraordinary Form in his private Chapel … which the Bishop served. After breakfast, he took me on a fascinating tour of some spectacular Lutheran churches. (This year, because of the timing of my flight back, we could only find time for coffee together.) He is a very nice man and a fine example of a model of episcopacy which is simple, warm, immediate, and unprelatical. He was very interested to have an update on the Ordinariate. Deretter beskriver han et par museumsbesøk – les hele dette innlegget her. There’s no consensus yet in the Oct. 5-19 Synod of Bishops on the controversial question of allowing divorced and civilly remarried Catholics to receive Communion, according to president of the US bishops’ conference, but he said many American bishops have their doubts. … St. John Paul had called the special synod in January 1985 to assess how Vatican II had been received in the life of the Church, examining both achievements and failures. In 1985, Cardinal Joseph Ratzinger was still in his first years as John Paul’s doctrinal lieutenant, and Cardinal Danneels was the boy wonder of the College of Cardinals, having recently been made a cardinal while in his 40s. John Paul’s biographer, George Weigel, explains that the Belgian was not happy with the German as the synod opened. “Shortly after the extraordinary synod convened on November 24, 1985, Cardinal Godfried Danneels of Belgium complained at a press conference that ‘this is not a synod about a book; it is a synod about a council!’” Weigel wrote. “The book in question was Cardinal Ratzinger’s review of the post-conciliar state of the Church, a lengthy interview with the Italian journalist Vittorio Messori, which had been published in early 1985 under the provocative title The Ratzinger Report. Danneels was right, of course, and Ratzinger would be the first to admit it. … [But] The Ratzinger Report was a major factor in setting the intellectual framework in which the synod’s deliberations were conducted and its recommendations framed.” …. George Deek er førstesekretær ved den israelske ambassaden i Oslo, og fortalte lørdag 27/9 sin egen families historie fra Jaffa/ Tel Aviv. Hans bestefar flyktet først til Libanon – i 1948 da krigen begynte – men kom senere tilbake til Israel og fikk tilbake sin gamle jobb. Hans familie i Israel har klart seg godt, det samme har familiemedlemmer som reiste til Canada, Australia og andre vestlige land – men de som ble værende i arabiske land har fortsatt ikke fått statsborgerskap eller andre rettigheter i landene der de bor. Med Israel for fred har her lagt ut en norsk oversettelse av talen. Hva skal skje på bispesynoden? Sunday marks the formal opening of the Synod of Bishops on the family, though to be honest there’s been so much public jockeying in the run-up it feels like the Oct. 5-19 summit of bishops actually started months ago. … Communion for divorced and remarried Catholics is likely to be one flashpoint, but all manner of other issues should be in play too, given that there’s almost no hot-button concern that doesn’t somehow fall under the rubric of the family. 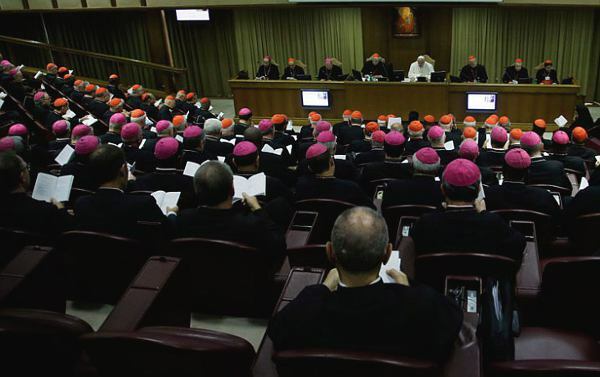 … Here I’ll lay out a brief viewer’s guide to the Synod of Bishops, with four things to bear in mind as the drama unfolds. 1. It’s truly the journey that matters rather than the destination. The point applies generically to any synod, since a synod is merely consultative. This isn’t a political convention, in which platform items will be voted in or out, candidates nominated or rejected, and so on. At most, what a synod does is present recommendations to the pope, and it’s always up to him what to do. As a result, there will be no new policy in Catholicism on anything as of Oct. 19, when the synod ends. This time the final product is even less decisive, because this synod is merely preparatory for another, larger synod on the family set for October 2015. At most, all that will be accomplished over the next two weeks is setting an agenda for the second meeting, and presumably Francis won’t make big-picture final decisions before both synods run their course. As a result, the best way to view this synod is as a way to take the temperature of the bishops on a variety of issues, looking for clusters of opinion and surprising notes along the way, rather than investing much importance in whatever they come up with at the end. 2. There is no single narrative about “what happened” at the synod on any given day. Although in theory there are themes for each day’s discussion in the synod, they’re extremely broad: “natural law,” for instance, or “difficult pastoral situations,” which can apply to basically everything under the sun. In reality, the roughly 180 bishops and few dozen other participants can talk about whatever they want. Francis also has asked that time be set aside each afternoon for free discussion, and there’s no set theme for that period. Each day, therefore, a wide variety of points will surface, and different media outlets and advocacy groups will highlight things of interest to them. One account may stress what a bishop from Europe said about gay marriage, and another what an African said on polygamy. Viewers probably will have to piece together the full picture. Moreover, it’s also important to realize that the working sessions of the synod are closed, so reporters have to rely on daily briefings and after-the-fact conversations with participants. Given that, accounts will likely vary in terms of reaction in the room when certain points were made, what people were buzzing about over coffee breaks, and so on. The bottom line is that covering a Synod of Bishops is like putting together a jigsaw puzzle, only without the picture on the box telling you what it’s supposed to look like at the end. 3. Perhaps the best thing about a Synod of Bishops is the global perspective on Catholicism it provides. Truth to be told, most American Catholics probably won’t be terribly surprised by the kinds of things American and European bishops say at this synod, especially if you already know who the players are and the views they represent. 4. Finally, expect the unexpected. This will be the ninth Synod of Bishops I’ve covered over the years, and in each of the previous eight there was some “black swan” development, meaning something out of the blue, that at least momentarily steered the debate down an unpredictable path. … The basic message is, don’t go to sleep on the synod, because you never know when something out of left field might change the game. On the eve of the Synod of Bishops on the family, battle lines have been drawn on hot-button issues such as divorced and remarried Catholics and annulments. Yet little is being said about two reasons that often cause a marriage to fail in the first place: lack of preparation, and forced marriages. An approved marriage preparation program is one of the four usual requirements to marry in the Church, the others being a six-month notification to the parish priest, Catholic baptism of at least one of the partners, and documentation certifying the freedom to marry of both partners. Yet according to a preparatory document that will guide discussion for the synod, preparation is often more honored in the breach than the observance. Programs come in different formats, such as intensive weekends, a series of weekly encounters, on-line formation, and “in-home” mentor couple programs. They can be offered by priests, experts, and married couples, and the content of the programs varies from one country to another. The one thing they have in common is that they generally require less time than the hours spent by many brides choosing their wedding dresses. Cardinal Raúl Eduardo Chiriboga of Ecuador certainly sees it that way. “Preparing for marriage shouldn’t be seen as part of the routine that couples have to go through to finally get married,” he said. The Rev. Héctor Franceschi, one of Rome’s leading church lawyers at the University of the Holy Cross, said the Church needs to rethink the preparation for marriage. “Many times, it’s reduced to two or three lessons on theoretical issues, with priests not even knowing what the future spouses are being taught,” he said. Franceschi says the Church actually has rich teaching on family issues, with documents such as Familiaris Consortio, Mulieris Dignitatem, Gratissimam Sane, and Humanae Vitae. “The problem is that very few pastors and laymen have read them,” he said. …..
Man antar at et ekteskap er gyldig, og i alle fall én av ektefellene er sikker på at alt er i orden, men så kan det vise seg – ut fra katolsk kirkerett eller også sivil rett – at det likevel ikke er gyldig. Etter sivil rett erklæres ekteskap ugyldige nokså sjelden, men etter katolsk kirkerett kan dette skje noe oftere – og det er Tribunalene som avgjør slike spørsmål. Misunderstanding – sometimes seasoned with plain ignorance – about canon law, annulments, and tribunal work is common among Catholics and pervasive among non-Catholics. What is unnerving to see, however, in the wake of Cdl. Kasper’s call for holy Communion to be administered to those living in “public and permanent adultery” (CCC 2384), is how high up in Church life such problems apparently reach. Taking the cardinal’s words at face value, he flatly rejects (for it “makes no sense”) declaring null any putative (a term Kasper does not use, but which I will discuss below) marriage if it seemed happy for a time, produced children, and lasted ten years. Let’s look at these factors. A putative marriage is an apparently valid marriage, entered into in good faith on the part of at least one of the partners, but that is legally invalid due to a technical impediment, such as a preexistent marriage on the part of one of the partners. Unlike someone in a common-law, statutory, or ceremonial marriage, a putative spouse is not legally married. Instead, a putative spouse believes himself or herself to be married in good faith and is given legal rights as a result of this person’s reliance upon this good-faith belief.